Physical Description: Double columns of 50 and 48 lines. In several good clear hands. Fine decorations of characteristic English style. On f.190b in a hand of cent. xvi early is: Antonius Thwaites me possidet: very carefully written. The name of Henry Thwaites is scribbled on f.159v, 211b. On the margins of the leaves in many places shields are carefully emblazoned, and the fore-edges have also been painted with shields. 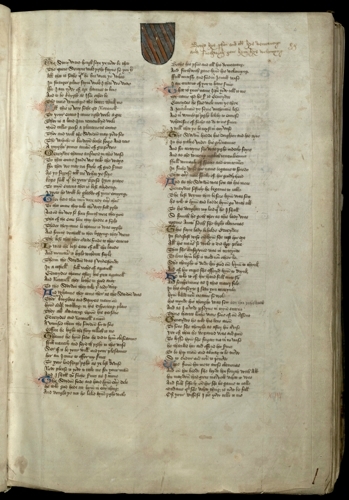 This latter ornamentation (as Mr W. Aldis Wright points out in his Preface to Generydes, edited by him from this MS.) does not extend over the edges of the portion of the which contains Generydes, though it has shields painted on the margins of its leaves. It is probable therefore that Generydes once formed a separate volume. I am unable to distinguish the writing of Generydes from that of the rest of the book. As to the owners of these shields, Mr Wright says (after mentioning: the occurrence of the name of Thwaites): "Anthony Thwaites may have been the son or descendant of John Thwaites of Hardingham, Norfolk, who married Anne, daughter of Sir William Knevet, and died 22 Hen. VII, leaving a son Anthony (Blomefield's Norfolk, V.1198, folio ed.). The book has evidently been in the Thwaites and Knevet families, for their arms are found in various combinations on the margins; and as the Thwaites arms do not appear in the first part, which contains the story of Generydes, whereas the Knevet arms are of frequent occurrence, it is possible that this may have belonged originally to the Knevet family, and may have been bound up with the Lidgate portion after the above-mentioned marriage of John Thwaites with Anne Knevet. The other coats of arms I have been unable to trace with any certainty. To do so would involve a minute and curious, but certainly lengthy investigation, and is altogether foreign to the subject of this preface." Donor: Part of the Gale collection, given to T.C.C. by Roger Gale in 1738. Marked A. 2. Collation: Collation : 18-38 48 (wants l) 58 (wants 7, 8 blank) | 68 (a)-98 (d) (wants 3) 108-228 (wants 8) 238 (wants l) 248 258 (wants l) 268 278 (wants 3) 288 (wants 1-3, and 7, 8 blank). Of Inde somtyme ther was a nobyll kyng. In paradise where all his seyntes dwell. Explicit the boke of Generides and of his faire lady Clarionas. In armys hast ye power and the myght. It to support and thus an ende I make. Requering hem all that is amis to mend. Of a sege shall he heren don be dayes old. And of my tale thus I make an end. Deo gratias. And clerly se what they gete yr to her mede. And to that strongi Cite vtter ruyn and distruction. Scriptoris anime te christe precor miserere. 1. f.38. King on throne on L. Lydgate as monk kneels and presents a book. Three courtiers on R. Red ground with gold flourishing. Full border with 8 shields, and another in the initial. 2. f.40. King Pelleus kneels on R., the Divine hand in cloud above. On L. 3 corpses of Myrmidons. A red angel with sword in air. On R. two small figures, one falling. The Myrmidons were destroyed by lightning and pestilence. 3. f.107b. In front on L. a man in plate armour (Achiles?) and blue mantle seated in a tent. Before him a man in gold armour kneels: two squires in white armour stand. In the background Hector in gold armour leads a troop. City on R.
Full border with parrots and shields. 4. f.137b. Achilles in tent in armour and blue mantle, between two men on R. under a roof. Hector dead in bed, covered with wounds. Behind a warrior at a city gate: two people address him. 5. f.172. Liber V. King throned on L. Page with cap in hand kneels to him. In the background two men, agitated. The masts of two ships seen over a hill. Mooney, L. R., The Index of Middle English Prose Handlist 11: Manuscripts in the Library of Trinity College, Cambridge (Cambridge, 1995), p. 115. Pearsall, D. A., 'Notes on the Manuscript of "Generydes"', The Library 5th ser. 16 (1961), 205-10.